The North Cascades Highway or State Route 20 is the northernmost route across the Cascade Mountain Range in Washington. It affords travelers a wide array of beautiful vistas and is part of the Cascade Loop, a 400-mile driving tour through the Cascades. This highway is only open from April through November, because of the intense avalanche danger the rest of the year. Tootsie Clark, who is well into her 90’s now, has for many years performed the same ritual every year on opening day of the North Cascades Highway. She gets up at 2 a.m. and sets to making her famous cinnamon rolls. When she has enough ready she packs them into her car and travels to the beginning of the highway where she passes them out to all the drivers waiting for the road to open. These cinnamon rolls can be ordered by the rest of us at The Eatery restaurant in Rockport, where Tootsie still helps out in the kitchen. But don’t go for breakfast thinking you can order a roll off the menu and have it delivered to your table. No, you must reserve these sweet treats the night before for breakfast the next day, due to their extreme popularity. Besides serving good, tasty food, The Eatery houses many items indicative of the history of the area. That was Tootsie’s idea – to make it a museum and a restaurant. 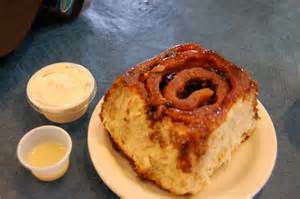 This entry was posted in Family Fun, Personalities, Restaurants, Seasonal, Towns and tagged Cinnamon Roll Lady, North Cascades Highway, Rockport, State Route 20, The Eatery, Tootsie Clark on July 25, 2011 by admin. I know, it made me hungry writing it.